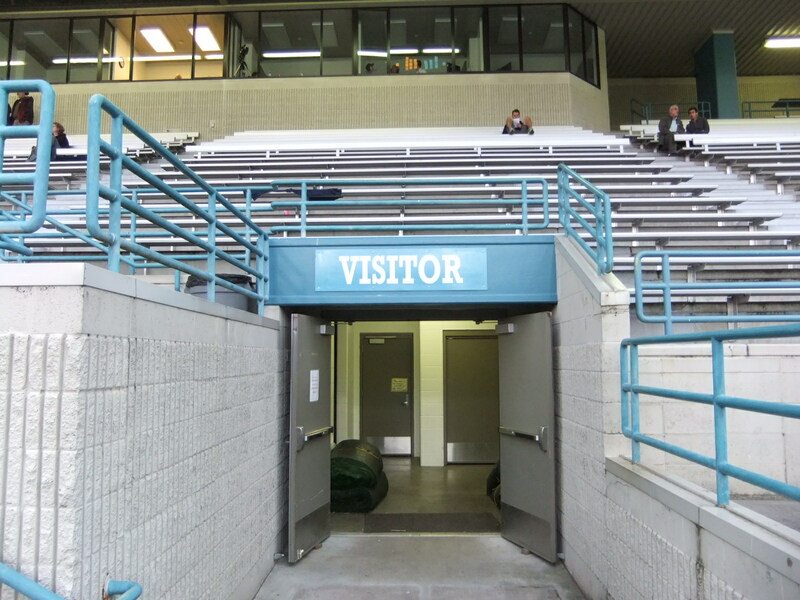 We continue our “Groundhopping” series with a look at another ground in Washington state. 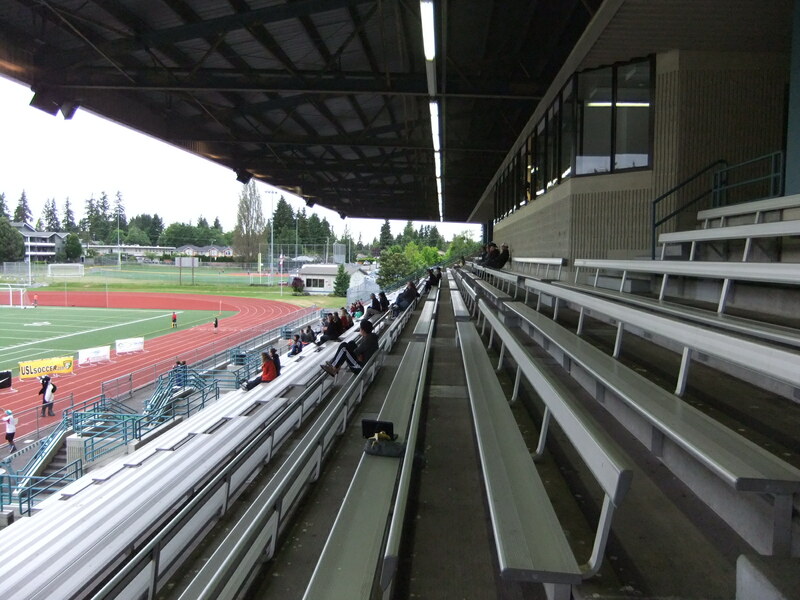 Edmonds Stadium, home of PDL side North Sound Sea Wolves. In our recent vacation slash dragging the wife and dog around a variety of weird and wonderful lower league stadiums as the payoff for a week at the beach down the Oregon coast, we took in three games along with the Whitecaps heartbreaking and frustrating loss at the Clink. We’ve already looked at our visits to Sumner Stadium to watch the Caps play Seattle Sounders U23s and Bellingham United’s Civic Stadium, but sandwiched inbetween those grounds and games was a trip to the lovely historic little town of Edmonds in Washington to see Vancouver Whitecaps U23s take on North Sound SeaWolves in PDL action. As we said in an earlier article, one of the joyful add ons to following football around the world is that you often get to see places, towns and sites that you would otherwise probably have never made a visit to. Now, sometimes you soon realise that you wouldn’t have actually missed out if you’d never gone there, but often you get some great surprises along the way and discover beautiful and quaint towns that are a joy to spend some time in. Edmonds is one such town. It’s a very historic town, with settlement dating back to 1870, and the whole vibe of the place is one of being pretty much untainted by too many modern day trappings and the chain stores that turn every high street throughout the land into almost carbon copies of each other. There are few of the names you see everywhere, instead you have some great local restaurants and coffee shops, independent stores and lots of local artisans. Even if you’re not heading down there for the football, or if you’re planning on going to nearby Seattle, it’s worth a visit or a stay. We were there of course for the football. We were one of the few. Who wouldn’t want to see some live football action under the Friday night lights? Most people it would appear, with only 65 turning out on a beautiful evening. Maybe the live stream that North Sound were offering kept everyone on their patios, enjoying the game on their laptops, whilst enjoying some barbecue and indulging in local craft beers. Or it could just be that the people of Edmonds don’t even know that they have a football team in their midst. That seemed to be gist I got from talking to some people on the night of the game and the day after. Grabbing a coffee from the wonderful Red Twig cafe the next day, the chatty barista was wondering what had brought me to Edmonds. The football last night was my reply, which brought a “oh how did the Sounders do?” response. When I explained they were playing the Whitecaps that evening and I was watching the SeaWolves, it brought a blank response. When I explained more, you could tell he had no idea that Edmonds Stadium hosted a good level of football action regularly, never mind why a guy with a foreign accent had come down from Canada to watch it. Which is all a shame, as North Sound put on a professional gameday experience with some of the best food you’re going to get at a football match round these parts. 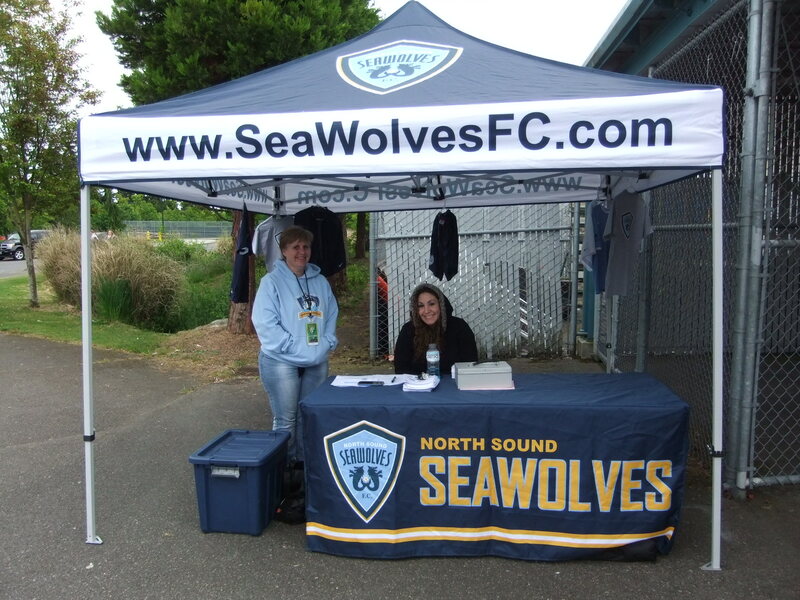 North Sound Sea Wolves were granted an USL PDL expansion franchise on November 29th 2010. The team basically replaced Yakima Reds, who had folded after ten years in the League. They played their first game, a 0-0 draw with local rivals Washington Crossfire, on May 7th 2011 and I think it’s fair to say that it’s been a struggle for them since. 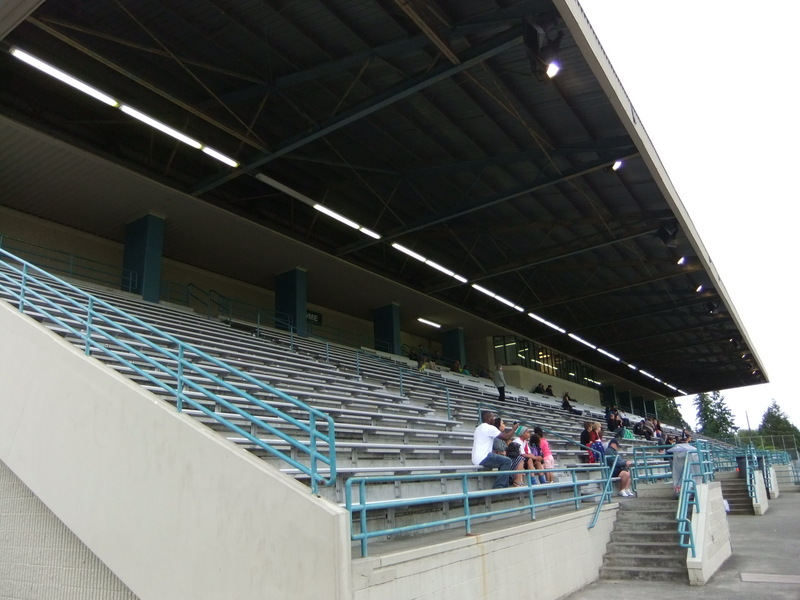 They played their debut 2011 season at the Frank Goddard Memorial Stadium in Everett before making the short move to Edmonds in 2012, which is where they now call home, playing out of Edmonds Stadium. A stadium with a stand that looks like something out of the Communist Soviet era or a spaceship from Battlestar Galactica. Situated in the grounds of Edmonds-Woodway High School at 212th Street South West, Edmonds Stadium is a 3000 capacity, multi-sports facility with artificial turf. The high school was built in 1998 and we’ve been trying to find out if that was when the stadium was also built. We’re thinking yes, but haven’t yet been able to confirm. 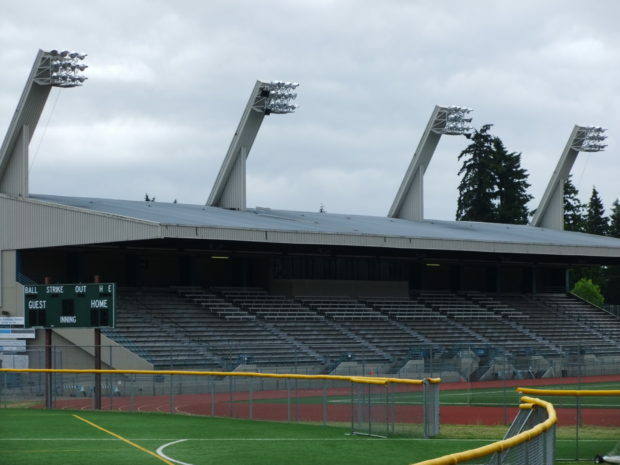 Edmonds Stadium’s surroundings comprise the school, houses and a number of baseball diamonds and tennis courts. The stadium is the regular home of the Edmonds Warriors high school sports teams amongst others, including the summer use by the SeaWolves. There is just the one stand, which comprises solely of silver metal bleacher style seats. It houses a press box at the back of the stand and the SeaWolves provide a live internet stream for all of their home matches. The stand is signposted for home and visiting fans and houses both dressing rooms. I sat all alone in the visiting section for this game, although there were some players’ families elsewhere in the stadium. In fact, I think family and friends basically made up the rest of the crowd. The pitch runs north to south, with the stand taking up the whole of the east touchline. The pitch has all the usual soccer, football and whatever markings on it and is surrounded by an eight lane athletics track. The only other structures around the ground are the team benches on the west touchline, the stadium scoreboard behind the south goal and a flagpole at the north end. There are four huge floodlights on the roof of the stand with some other standalone lights situated around the rest of the stadium. The stadium is in a nice tree lined setting and there’s a lot worse places you could spend a lazy summer evening watching football. Entry was $10 (which was reduced down to $7 for their last home game against Washington Crossfire – youth were $3 and under 7’s free), and I was pleased to pay it as my small attempt to support local football and put some, albeit little, money in the club coffers. The fact that there was a pretty girl with a lovely smile taking the money also helped with a warm welcome! There’s the usual PDL style free four page colour photocopied teamsheet to go with your printed colour ticket and there’s even a killer whale mascot to entertain the kids. For me though, the highlight of my visit (apart from the result!) 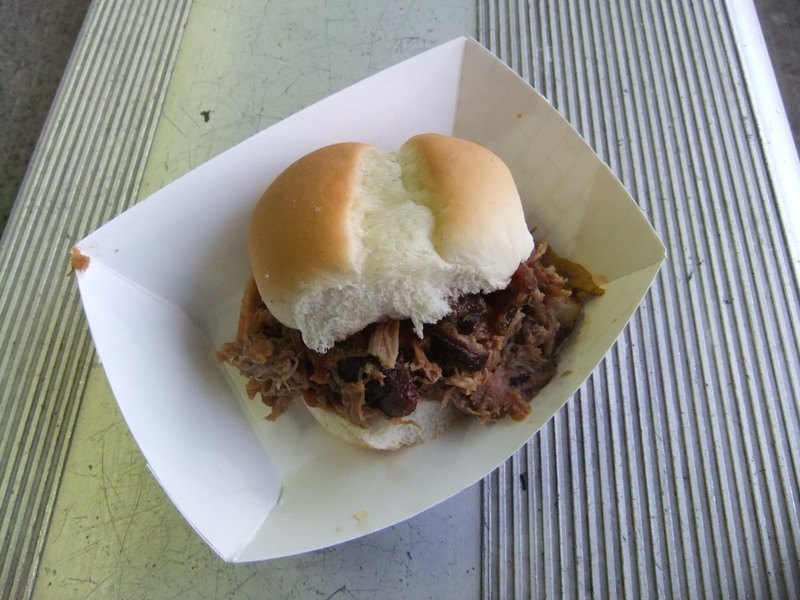 was the delicious food that was on offer on the concourse from the Celtic Cowboy BBQ. Pulled pork sliders for $3 amongst a whole host of other stuff. They were amazing, as you can see for yourself. There were also hotdogs, popcorns and all that nonsense available from another stall for those with no taste for some decent food. Will definitely have to check out their actual shop the next time. When the SeaWolves first started in the PDL, their average attendance in Everett for their debut season was 182, dropping to 135 last season. This season’s six home games have so far seen them average 263, which is great and a step in the right direction, on paper. Closer analysis sees that they drew in 630 for their home opener against Portland and 645 for the July 4th spectacular against Seattle. The other four games have seen an average of 75, but if those two big games can help them keep going, then great stuff. Their final home game of the season is tonight, where they play host to the Caps again, which is why we’re running this piece when we are. The mission of the SeaWolves is to “promote and to grow the beautiful game of soccer in the North Sound and Northwest Washington area”. It’s great to see and great for Washington, and in particular Snohomish County, to have another place for their local players to put themselves in the shop window. That said, the SeaWolves seem to have failed to quite capture the local public’s imagination and you have to wonder just how long a team like that can keep going with mounting costs and falling spectator interest. If they can keep it as a going concern then it will be a great achievement and hopefully a useful vehicle for some of the top local talent. We wish them nothing but the best in making this happen but it could be a difficult road ahead. They’ve not had the best of 2013 seasons. With the one game of the season to go, they are bottom of the PDL’s Northwest Division with just 8 points from their 13 games after two wins and two draws. Their goal difference is minus 14. The game I saw a right humdinger, with the Whitecaps never give up attitude paying off big time. Cam Hundel, who had an excellent game, opened the scoring for the Caps in the 27th minute, before the SeaWolves’ Zach Hammond tied things up nine minutes later. That was how they went in to the half but North Sound stunned Vancouver by taking the lead in the 56th minute when Nick Hamer hit home his brother Zach’s cross. The Caps fought back well and Harry Lakhan tied things up in the 74th minute with a stunning long range strike. One of the Caps’ goals of the season. It was looking as if this was going to be two crucial points dropped before Michael Winter popped up with the winner three minutes into stoppage time from just inside the box. The game ended amid farcical scenes when SeaWolves’ coach Ed Moore was sent off in bizarre circumstances. Moore was furious that a Whitecap player wouldn’t take the ball he held out for him for a throw in and instead went to collect the match ball that had gone out of play. The coach berated the ref about the perceived timewasting and, fuming, he then kicked the ball he was holding on to the pitch towards the official. Even more hilarious was him telling his players to “keep your heads” as he walked round to the stand. Always action in the lower leagues! 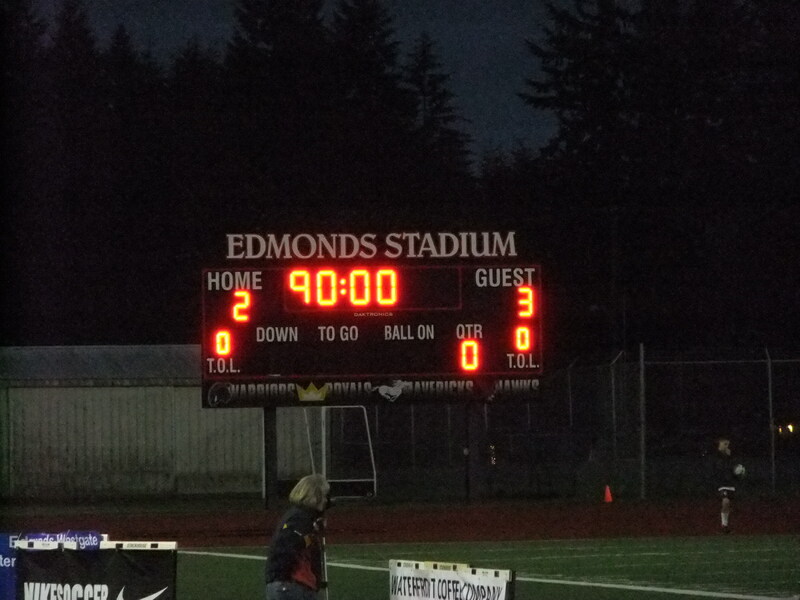 And in the end the 3-2 victory was a huge three points that have helped the Whitecaps claim a playoff spot. Result aside, it was a fun night out and an enjoyable stay in a great little town. It’s highly recommended. If you can make it down for tonight’s game, then do. But if not, keep North Sound SeaWolves and Edmonds in mind for some groundhopping of your own come the next PDL season or on your next trip to watch the Caps play in Seattle.